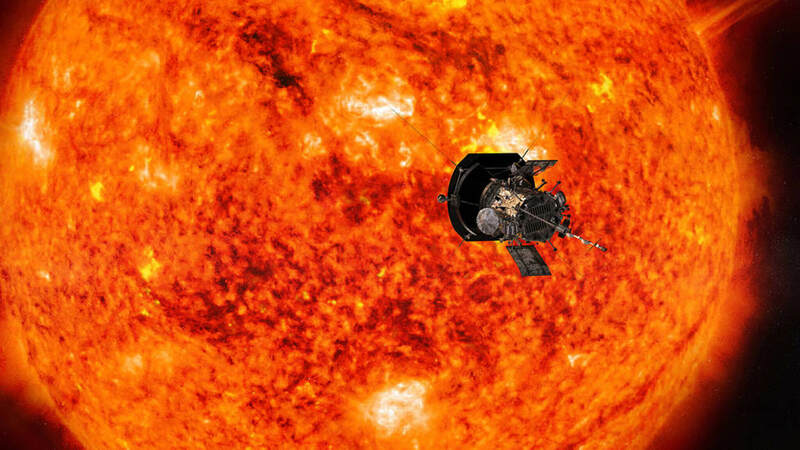 Home » How Will NASA Get this Probe to the Sun Without It Melting? A human-made spacecraft is finally heading to the center of the Solar System. NASA’s first launch window for the Parker Solar Probe begins at 3:33 a.m. ET this Saturday, and if all goes well, the ship will then begin its journey to the Sun. Not directly into the Sun, of course. It will pass Venus seven times, eventually arriving within 3.8 million miles of the solar surface, a little more than four times the Sun’s diameter. But despite 2,500 degree temperatures, the ship’s instrumentation will remain at just 85 degrees Fahrenheit, which seems positively chilly, given the circumstances. The key technology is a thermal protection system that shields the ship, alongside a water-powered cooling system, according to a Johns Hopkins Applied Physics Lab press release. That thermal protection system took 10 years to develop. It’s got two layers of carbon-fiber-reinforced carbon, which retains its structural properties in high heat. In between those layers is carbon foam, a material that’s mostly air and thus doesn’t transfer much heat. On top of that is an outer layer of aluminum oxide, a white material that reflects light. A layer of tungsten sits between the carbon and aluminum oxide so the two don’t react and turn the outer layer grey. But the environment around the Sun is formidably intense. The corona contains temperatures of millions of degrees Fahrenheit, and scientists are trying to understand why it’s so much hotter than the Sun itself, whose surface is more like 10,000 degrees. In the 1950s, scientist Eugene Parker, for whom the solar probe is named, helped explain how the solar wind originates from the corona. The Parker Solar Probe will be able to probe directly the questions surrounding that process, Sterling explained. The Parker Solar Probe will fly through the outer corona, but particles are sparse enough that they don’t transfer much heat to the ship, according to NASA. It’s kind of like reaching your hand into an oven—if it’s in there just briefly, it doesn’t hurt unless you touch the metal. Although we’re all extremely excited for the launch, it will be a while before we get to enjoy scientific discoveries from this mission. The probe won’t make its closest approaches to the Sun until 2024. Until then, it will make successively tighter orbits, passing Venus seven times to accelerate via the gravitational slingshot maneuver. Once the probe arrives, hopefully it will answer some of humanity’s burning questions about the Sun—but surely it will spawn new mysteries, too.